If there is any advice I could give you right now, it would be to get your ideas out of your head and on to paper. If you're anything like me, then you probably think you're not a paper person and you don't like to write things down. Don't let this belief about yourself keep you stuck. When you get your ideas out of your head and recorded, you give them a chance to live. Whether it is a blog or a business that you're working on part time while also working a 9-5 you will most definitely need a planner that has space for you to record ideas. Your ideas are only valuable if you can remember what they are. Planners will also help to give you a visual of what your time actually looks like. This will help you to better prioritize what is a necessity and what is not. Make a list of all of the things you need to do and then sit down with your planner and pick a time and date for each thing. To take it a step further, put the amount of time you plan to spend on each activity beside it. I know I just told you to get a planner, but let me be honest with you. Getting a planner can be a trap. If you're not honest with yourself and don't actually schedule what it is you've planned to do, then you'll be at the same place you are next year. Don't plan and then fail to execute. Planning alone won't get you where you want to be, but action will. Hold yourself accountable by scheduling. This will remind you of what you had planned. Use your phone to schedule reminders for what you've written out in your planner. Discipline made simple is the ability to follow through and continue following through. Setting goals, sticking to schedules, planning....it can all sound so overwhelming. Start small. Don't try to plan your whole year and hold yourself to sticking to it. Remember that this is new to you. Start with picking one thing to plan, schedule and then execute. Think of it as cultivating a new habit. Don't try do it all. Give yourself small tasks and once your are able to follow through with the small tasks, then add on from there. Practicing discipline takes practice! Having a good thought life is important when trying to balance your 9-5 and blog, because you must learn how to control your mind. You have to train your mind to always be able to find time for the things that are truly important without sacrificing your health. Balancing your life starts in your mind. If you believe you can do it, then you can. If you believe you can make time, then you will. If you practice being thankful for where you are and what you have it will multiply. Yes, time can literally multiply for you if you are grateful for the time that you have no matter how small of an amount. Train your mind to think good thoughts. When you are at your 9-5, be all there. Give it your all. 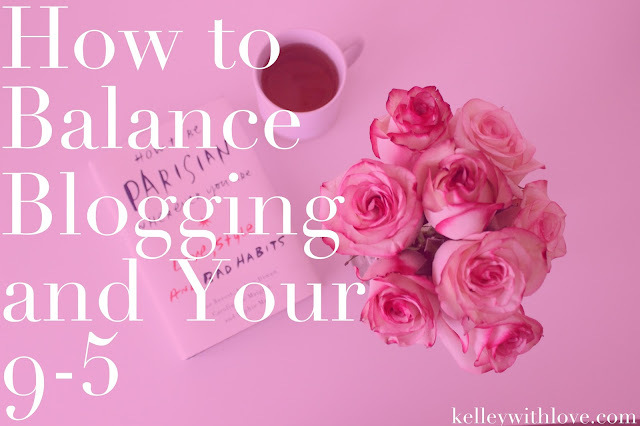 When you are working on your blog or business, give that all of your focus. When you fill the position you are in, and you do a good job at it, then you open yourself up for better opportunities and more creative ideas. Do your best where ever you are and don't wish you were somewhere else. The truth is, where you are now is preparing you for where you want to be and will be. So be your best in what ever position you are in and make time to work hard towards your dream whenever you can. I've just returned to work after a few years off and I've been struggling with the balance. I have a huge to do list for my blog but the action piece has been lacking. Great motivation and tips to get me back on track!